When my husband and I bought our first home last fall, we were thrilled to have a formal dining room, but there was one hiccup: We didn’t own a dining table. That beautiful space, which I had insisted was an absolute necessity, sat empty for months, though it wasn’t for lack of want. Adding to the pressure, we were newlyweds slated to host Thanksgiving for the very first time. Every morning, for weeks, I sat in the middle of the room and stared at the natural light that flooded the room, the lyrical grains in the original hardwood floors, and the bare walls desperate for life and a good coat of paint. My thoughts were rapid-fire. Should I choose a round table, or build one of those adorable banquets with built-in storage? Should I leave the table set every day or only for special occasions? And, good heavens, what should I do about drapes? The questions mounted and I felt incapable of doing anything except searching Pinterest for the answers. As the holidays approached and I carefully curated the rest of the house, it hit me: I couldn’t make decisions because I didn’t have a clear vision of how I would use the space. I essentially had a holiday version and an everyday version of the room in my head and I couldn’t quite seem to reconcile the two. How could a room be a heartwarming, seasonal vignette and simultaneously be a comfortable space where I could pay bills in my pajamas? As it turns out, when done right that space can, in fact, be all that and more. As we approach the holiday season, allow me to offer some thoughts for how you, too, can make the most out of this often-underutilized room for the holidays and beyond. A dining room is perhaps the most versatile room in the house. When you’re ready to establish your dining room or envision a new life for an existing design, consider this: What purpose do you want the space to fulfill? In addition to hosting meals, it can serve as a homework station, craft area, home office, game room, catch-all for keys and mail, or any number of uses. Your end goal will guide all the decisions along the way. If the space is multifunctional, consider storage options: bookcases, sideboards and china cabinets, closed bins and baskets. Having storage nearby allows you to quickly transition the space to a new use and no one will ever be the wiser. 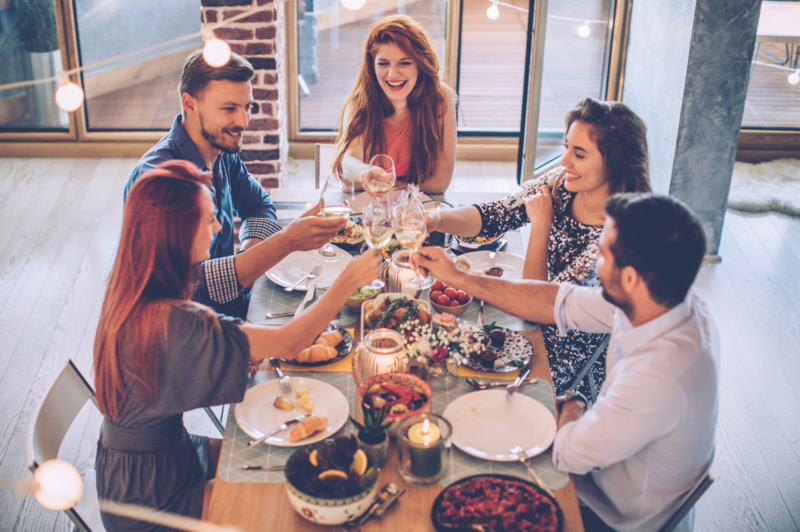 This is especially important during the busy holiday season where we often pivot quickly between work and holiday parties and preparations. If you want the room to feel more formal, incorporate elements such as intricate centerpieces and multi-layer place settings. The holiday season presents plentiful opportunities to augment the formality of this room. For instance, even in a more casual space, luxurious table linens paired with a seasonal centerpiece of holly leaves, garland and tapered candles immediately elevate the space. Once you’ve achieved your ideal design, think about how you will actualize your aspirations. Will you eat dinner there each evening? Will it become the new gathering spot for your family? Will you make it a technology-free zone where you go to unwind? The design of the room and your intentions for it should be complementary. Now that you can visualize your goal, let’s talk about furnishings. From tables and chairs to rugs and drapes, the layers of a dining room are many. Today, more than ever before, there is a table for every situation, so how do you know which one to choose? First things first, the shape of your table should accentuate the shape of the room. For instance, rectangular tables match the scale of a large or narrow space, while round tables are best suited for smaller or open concept rooms. Note that the continuous edges of a round table give the illusion of a bigger space— choose a glass top to further enhance this effect. If you have a tight area, a table with a leaf is ideal. You can expand it during the holidays or when you have company, but remove the leaf for a more manageable size during daily life. So, you have a table, but where will you sit? Seating is rich with opportunity and often becomes a focal point depending on the material and color. For a more formal, traditional feel, pair a wood table with matching wood chairs, or even upholstered wingback chairs. Benches and banquets create a more casual feel and can also provide storage. To create more room for your eye to move, try armless or low chairs, or for a modern contrast, mix and match seating: chairs on one side and a bench on the other, or wood chairs in alternating colors. This is a prime chance to make a statement. If your walls and decor feel a bit neutral, you can punch up the room with chairs upholstered in rich sapphire or garnet. To add a touch of elegance, consider monogrammed slipcovers. Bonus: Many are machine washable, making them classy and functional. Whether your dining room serves a singular function or pulls double duty, it may crave additional furnishings, especially during the holidays. Sideboards offer storage and create an optimal surface to serve food, keeping the serving dishes from taking up valuable real estate on your table. If you only use this space occasionally, try repurposing furniture from around your home. Entryway and sofa tables make perfect substitutes for sideboards, and bookcases present delightful display space for holiday decor or even dessert trays and gifts during a party. On the walls, open shelves provide an alternate storage option. They can display china, personal collections, or even masterpieces created by little ones! During the holidays, drape shelves in garlands and lights to create an ethereal ambiance. For windows, hang drapes at the top of the wall to offer a dramatic cascade and make the room seem larger. Also, why choose just one window covering? Consider two layers: a thin white sheer below a thick colored curtain. The top layer can be pulled back, allowing light to permeate the sheer layer while still offering a certain amount of privacy. Floors are often an overlooked area of the dining room, but they are a treasure trove. If you have hardwood floors, a well-placed rug can define your entire space, but it should be large enough that a chair won’t catch the edge when pulled back. The general rule is to account for 36 inches of rug on each side of the table. A jute rug is fairly simple to keep clean, while low pile rugs allow chairs to slide under the table. Consider choosing a simple design that incorporates accent colors found in the room. It’ll help tie everything together. 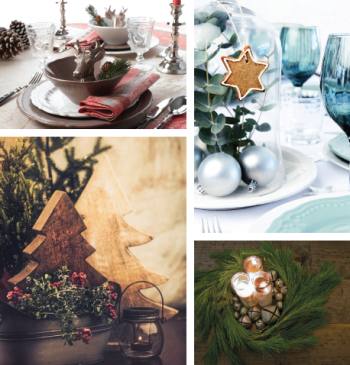 During the holidays, options for table decor can be overwhelming. From linens to china to centerpieces, it’s hard to know where to start. Personally, I like to build from the bottom up. When it comes to linens, it all depends on how sumptuous you want the room to feel. Double-layered tablecloths that touch the floor lessen the amount of light that gets to move in the room, giving it a heavy, formal feel. Conversely, a simple runner delineates the center of the table and creates an airy feel. For china, don’t be afraid to experiment with color! Try coordinating rose-colored chargers with milky white plates and snowflake adorned bowls, or for a bolder look, couple bronze chargers and bowls with amethyst colored plates and napkins. A pop of color or imaginative pairing of patterns is often a conversation starter, especially at seasonal gatherings. The last component is the centerpiece. One quick search on Pinterest will present a dizzying array of suggestions, especially for the holidays. I’ve always found that the trick to centerpieces is balance. It should quite literally center the table, and it can incorporate absolutely anything: candles, vases, baskets, plants, marbles, metal letters, lights, everything but the kitchen sink. If you aren’t sure what to do, start with a tray. Place it in the center of the table and start layering—a small stack of colorful antique books next to a trio of white pillar candles and a glass bowl of mints, or a quartet of brass herb planters surrounded by decorative pebbles. During the holidays, a set of hurricane vases filled with beloved ornaments adds dimension and nostalgia, while a pair of small poinsettias provide a pop of color and fresh fragrance. 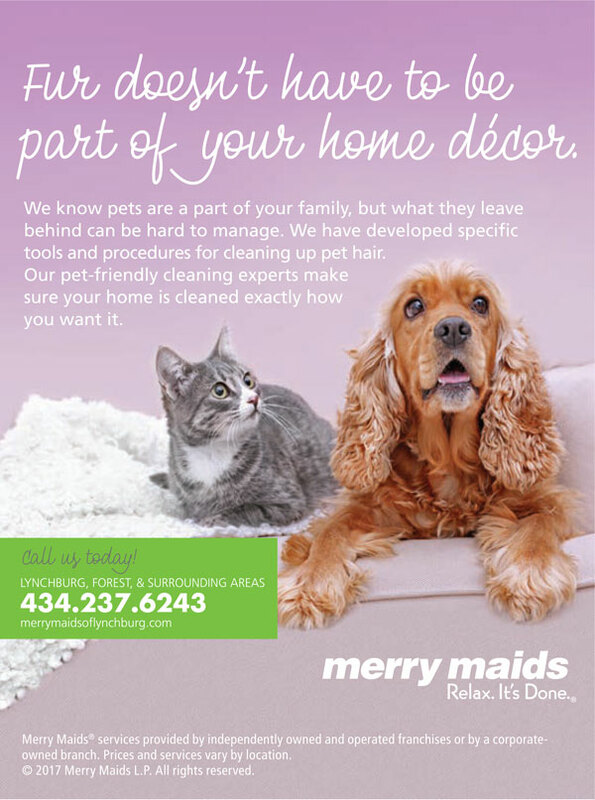 The holidays are the perfect time to put your new design into action. Throw a cookie exchange or a card decorating party, both of which will make ample use of the entire table. 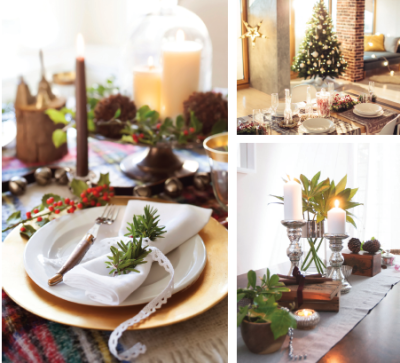 During a holiday cocktail party or gift exchange, push the dining table against the wall to create more room to roam. If you’re feeling extra festive, turn your dining room into a gift wrapping haven and invite all your friends. The sideboard can hold all the accoutrement—ribbon, bows and tags—while the table embraces roll upon roll of wrapping paper. Before you dive into design choices, take a few minutes to sit in your dining room and ask yourself: What is the purpose of this space in my home? Whether it is a hub of family activity, a secondary office or a sanctuary for elaborate meals, a little imagination can inspire your dining room to serve you well during the holidays and throughout the year.